War and landpower's role in the twenty-first century is not just about military organizations, tactics, operations, and technology; it is also about strategy, policy, and social and political contexts. After fourteen years of war in the Middle East with dubious results, a diminished national reputation, and a continuing drawdown of troops with perhaps a future force increase proposed by the Trump administration, the role of landpower in US grand strategy will continue to evolve with changing geopolitical situations. 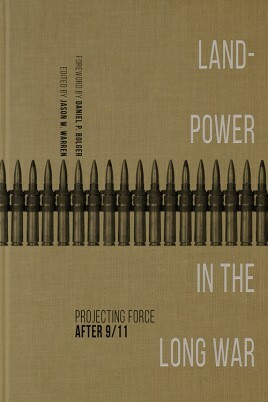 Landpower in the Long War: Projecting Force After 9/11, edited by Jason W. Warren , is the first holistic academic analysis of American strategic landpower. Divided into thematic sections, this study presents a comprehensive approach to a critical aspect of US foreign policy as the threat or ability to use force underpins diplomacy. The text begins with more traditional issues, such as strategy and civilian-military relations, and works its way to more contemporary topics, such as how socio-cultural considerations effect the landpower force. It also includes a synopsis of the suppressed Iraq report from one of the now retired leaders of that effort. The contributors - made up of an interdisciplinary team of political scientists, historians, and military practitioners - demonstrate that the conceptualization of landpower must move beyond the limited operational definition offered by Army doctrine in order to encompass social changes, trauma, the rule of law, acquisition of needed equipment, civil-military relationships, and bureaucratic decision-making, and argue that landpower should be a useful concept for warfighters and government agencies.